I feel awful that I haven't posted for a week, and it hasn't even been because I was busy, but more of a lack of motivation. I blame it on being shopping deprived! For the past couple weeks I've been dying to go shopping with all my Christmas money, but I had no way to get to the malls. Finally, this weekend I went both Saturday and Sunday! I spent 4 hours and $166 at Forever 21 and my grandmother was such a good sport while she held my clothes I was trying on, picked out some cute tops, gave her opinion on outfits, and socialized with the cashiers. She's so much fun to go shopping with and I'm lucky I inherited her shop-'till-you-drop genes! Many celebrities donned nudes and blacks for the 52nd Annual Grammy Awards. While Lady Gaga's over-the-top ensemble didn't surprise me, Katy Perry's lower-key gown did. 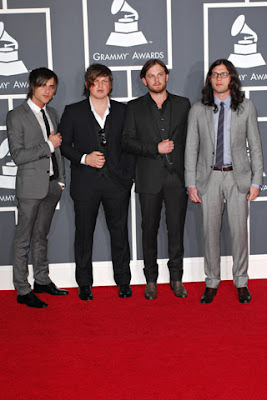 I was very happy my favorite band, Kings of Leon, won so many awards. Here are some noteworthy looks you shouldn't have missed, even if you didn't get to watch the show last night. My favorite dress by far is Keri Hilson's Dolce & Gabbana. Ciara, adorned in a black lace Givenchy Haute Couture gown. Jennifer Hudson looks chic in Victoria Beckham. Katy Perry flowered in Zac Posen. Keri Hilson looked simple and elegant in Dolce & Gabbana. won 4 awards last night. with what she can find to tangle her body in. in this Elie Saab Haute Couture dress. Taylor Swift wore Hollywood siren well, in Kaufman Franco. You look very cute dear! and you have a lovely blog! 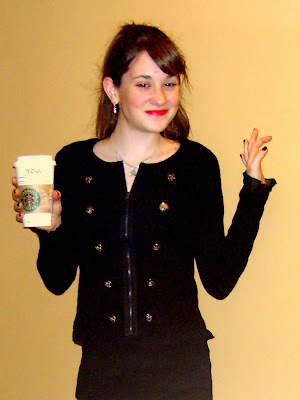 Awwww... what a great outfit. That's a really interesting top, and the jeans are a perfect fit. From these Grammy pics, I like quite a few. John Legend's suit looks great, Rihanna is stunning, and Lady G is doing her thing as usual. I am Tom Jay and i would like to know if you are interested to earn advertising money by serving mobile advertisement on your web site. Mobgold is one of the largest mobile ad networks which have been working with social network sites, content portals, iphone Apps developers or mobile operators to help them increase their revenue by serving mobile advertisement on their wap site, Apps or mobile internet channels in a very rewarding way. What Will Happen to His Label?